Access to water for irrigation is essential for agricultural families in many areas, yet women and men farmers have unequal access to irrigation technologies. When women benefit from irrigation technologies, this can lead to improved household nutrition and health. 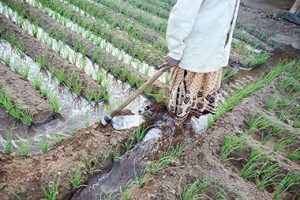 In this blog, originally published on the Chicago Council on Global Affairs Global Food for Thought blog, IFPRI researchers Elizabeth Bryan and Hagar ElDidi reflect on how to ensure that both women and men farmers can access and benefit from irrigation technologies. While women farm alongside men and share the same goals for improving their agricultural livelihoods and household well-being, the benefits of irrigation do not accrue equally to men and women, even when they are in the same household. Women face different challenges and unequal opportunities in accessing and benefiting from irrigation technologies. To address these differences and ensure irrigation and water management programs and projects benefit women as well as men, implementers need to consider approaches that take into account the differences in women’s and men’s agricultural roles, as well as context-appropriate channels for reaching women farmers. Looking at differences in how the costs and benefits of small-scale irrigation technologies are distributed across men and women within the same households, IFPRI research found that women are more constrained in adopting and benefiting from irrigation technologies compared to men. In Tanzania, while men started utilizing drip irrigation and motor pumps, women in the community still relied on labor-intensive manual irrigation methods, like hauling water with buckets. Even though men and women in a household shared the work on irrigated plots, women had less control over (or even knowledge of) selling the produce and the income generated. In some cases, the decision-making and asset ownership gaps between men and women increased after introduction of irrigation technology, as well as women’s work and time burden. Unless constraints to women’s ability to benefit from the introduction of small-scale irrigation technologies are addressed, women’s empowerment is not a guaranteed outcome of irrigation. In contrast, when irrigation technologies are designed with women’s needs in mind and women are able to use and benefit from the technologies, women may have greater status in the household and community and have greater decision-making authorities in other aspects of their lives. In Tanzania, for example, research found women control income from vegetable gardens, and expressed satisfaction with access to drip kits that helped increase the productivity of their gardens and thus decreased dependence on their husbands for income. Moreover, when women benefit from access to irrigation technologies, this can lead to improved livelihood, health, and nutrition outcomes along several pathways. These pathways play out in different ways across different local contexts depending on women’s roles in agricultural production and their decision-making authority at home and in the community. Production: Access to irrigation reduces the risks of crop losses in rainfed systems, can boost crop yields as much as three times, and can enable farmers grow multiple harvests per year, including during dry periods. Men and women employ these benefits differently, however. Emerging evidence suggests that women are more likely to use irrigation technologies to grow nutritious crops for household consumption, for example, while men favor growing cash crops. In some contexts, women prefer to grow a more diverse set of crops, which can lead to improvements in dietary quality where production diversity is low. Income: Men and women also tend to spend agricultural income differently, with women more likely to spend more on food, health, and education expenses. Thus, better health and nutrition gains may be realized when women’s control over income from irrigated production increases. Water supply, sanitation, and health: Access to small-scale technologies can also be beneficial when irrigation water is put to multiple uses, including for livestock watering, drinking and washing purposes. Given that it is typically women’s responsibility to collect domestic water, their involvement in the design of irrigation systems and their access to small-scale irrigation technologies can both reduce their time spent collecting water and make more water available for good hygiene practices. Paying special attention to gender and social inclusion in each stage of an irrigation intervention can help ensure that women participate in and benefit from irrigation, while facilitating these pathways from irrigated production to improved nutrition and health outcomes. Since irrigation roles are gendered—for example when it comes to the types of crops planted or the area and location of land allocated to men and women--women’s preferences for irrigation technologies are different from men’s. Designing and providing irrigation technologies with labor, mobility, cost, and use requirements that are suitable for women can help ensure higher demand and a suitable product for women. Women also need to have knowledge of irrigation technologies and practices that suits their needs. Reaching women where they are and through information channels they trust, like women groups and networks, can ensure that women know about the technology and how to use it. Women often face challenges accessing credit, control over income, and decision-making authority, which prevent them from adopting irrigation technology. Finally, women may discontinue using the irrigation technology if they are unable to control the earnings from irrigated production or if it increases their work burden. Recent IFPRI research provides a checklist of guiding questions to consider for each phase of technology adoption, which can help policy makers and practitioners better target technologies and its benefits to women. Integrating gender-sensitive approaches to irrigation technology dissemination can facilitate wider adoption of these technologies, leading to improved agricultural livelihoods, improved food and nutrition security, increased climate resilience, and women’s empowerment. This work was undertaken with support from the United States Agency for International Development, the UK Department for International Development, the Bill & Melinda Gates Foundation, and three CGIAR research programs: Agriculture for Nutrition and Health (A4NH); Policies, Institutions, and Markets (PIM); and Water, Land, and Ecosystems (WLE).